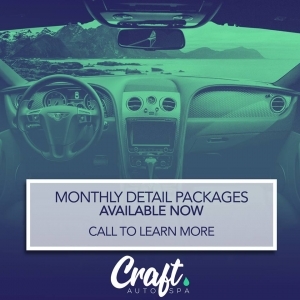 As a member of our VIP program, you will receive bi-weekly or monthly detailing visits from our Craft Technicians to service your vehicle. On our first visit you will receive our Gold exterior/Presidential interior service, and from then on we will do whatever it takes to keep your vehicle in pristine condition. Our members get priority treatment, with bookings whenever you want and services rendered however you’d like. Our detailer’s main concern is keeping your car looking brand new, so you can trust you’ll never have to clean your car as part of our program. Become a VIP Member today! Craft Auto Spa Now Offers Paint Correction Services! The correction is a multistage process in which different grades of polish are used, from heavy cutting compounds to remove any surface material, to finer products which remove any marks the heavier products may have missed and refine the finish. From start to finish Jonathan emits the term professional .Made my work truck look brand new in a timely manner and more than reasonable price . Highly recommended and will be a life long customer for sure . I’ve been dealing with John for years and every time it’s been nothing but absolute greatness. He always shows up on time and gives the greatest service. Would definitely recommend to others. The ceramic coat he provides is the best that I’ve ever seen.